Terry Hancock sent Space.com this image of the Rosette Nebula taken under a full moon on March 16, 2014 from western Michigan. 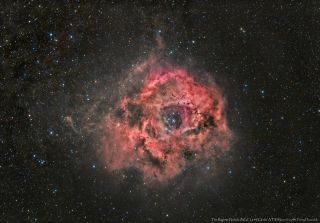 The Rosette Nebula stars blooms with cosmic color in a stunning new image by an amateur astronomer. Avid astrophotographer Terry Hancock carefully timed this beautiful shot of the Rosette Nebula—shooting for nearly three hours under a full moon to create the nebula view. Hancock captured this Rosette Nebula view on March 16 from western Michigan. For astrophotography fans, this photo is the result of 3x2 minute exposures each RGB bin 1x1 (no luminance) and a total of 18 minutes added to the h-alpha data, which he captured using the QHY11S camera and Takahashi Epsilon-ED180 telescope. The total exposure time 2 hours, 48 minutes. "I think I timed it just right," he said. "With the Rosette just passing the meridian and at nautical twilight at 20:52 EST — only several hours following full moon — I figured I had maybe 20 minutes before the glow of the moon upset my chances." Also known as Caldwell 49 or NGC 2237, the Rosette Nebula is located 5,200 light-years away at the edge of the molecular cloud Monoceros. One light-year is the distance light travels in one year, or about 6 trillion miles (10 trillion kilometers).